Des Moines Police have released the radio transmission from a cop who tried to stop a suspect in an S-U-V last night, but wound up being dragged down the street. Sergeant Larina Blad radioed: "I’ve been run over." Blad gave the dispatcher her location and a description of the fleeing vehicle. "What happened?" the dispatcher asked. "I’ve been run over," Blad replied. "I’ve been run over." The dispatcher sent "all units" to the scene. "I’ve got medics rolling already," the dispatcher told a policeman who had arrived at Blad’s side. "Is it a hit and run?" the officer asked. The dispatcher replied: "It definitely sounds that way, yes." The suspect, 24-year-old Irving Cartagena, was allegedly driving drunk and his license had been revoked. Cops caught up with the suspect who was driving a white Chevy Tahoe. "Subject in custody?" the dispatcher asked. "The subject is in custody," the cop said, telling the dispatcher the man had been arrested in an alley. The dispatcher asked the cop on the scene of the drive-over for a condition report on Sergeant Blad. "She’s alert, conscious, breathing," the policeman replied. 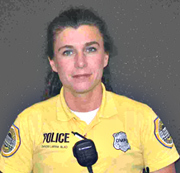 Sergeant Blad was battered and taken to the hospital, but she suffered no broken bones.